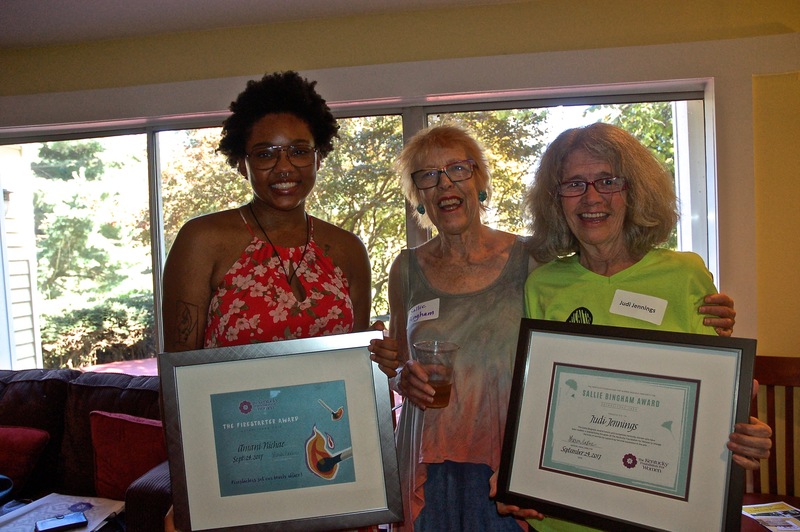 On Sunday, September 24 Kentucky Foundation for Women community members gathered at Hopscotch House as Judi Jennings, former KFW Executive Director, received the Sallie Bingham Award and Amani Nichae received the Firestarter Award. The Firestarter Award honors a young woman who shows meaningful promise in developing as a feminist social change artist, and whose work has the potential to create positive change for women and girls in Kentucky. Nichae, who lives in Lexington, is a photographer and activist. A student at the Art Academy of Cincinnati, she is a photographer for Be Bold, an organization dedicated to feminist ideals of positive body image, self-esteem, and the empowerment of girls ages nine to eighteen. Nichae organized Fairly Local, a Lexington art show designed to showcase artists and build community that benefited Step by Step Lexington, a mentoring ministry for at-risk young single mothers ages fourteen to twenty-four. Named for KFW’s founder, the Sallie Bingham Award recognizes Kentucky women who are leaders in changing the lives of women and girls across the state by supporting feminist expression in the arts. Recipients show a demonstrated and sustained commitment to excellence in feminist art for social change in Kentucky and to advancing social change that impacts women and girls in Kentucky. The award was founded in 1996 by former KFW Director, Ann Stewart Anderson. Winners are selected by nominations or by recommendation from the KFW staff or Board. Previous winners include fabric artist Alma Lesch, writer and arts mentor Judy Sizemore, and writer Crystal Wilkinson. “The Sallie Bingham Award honors artists and change makers that create their own legacy and leave their imprint on our world. It is important to recognize how their work has made significant progress towards inclusive gender equity and changed the cultural conversation,” said Sharon LaRue, KFW Executive Director. “Partnering the wisdom of the Sallie Bingham Award with the risk-taking of the Firestarter Award connects two generations and collectively calls into being a future with a bold horizon,” she noted. Here is a look at the work that Judi and Sallie continue to do to provide a pathway for activism for women who want to make a difference. Anyone who knows former KFW Executive Director Judi Jennings is not surprised that she is still hard at work on creating social change through artistic expression. Her first awakening to the power of art for social change was in the early 1990s when she was Founding Director of the University of Louisville Women’s Center. Having worked at Appalshop, an arts and education center in Whitesburg, Kentucky, Jennings knew about the American Festival Project, which was taking place at Dartmouth College that year. She went to the festival hoping to do a comparable event at University of Louisville (which came to fruition). “On a very hot day, I was sitting in a very air conditioned theatre on the Dartmouth campus watching the one-woman play Snake Talk, written and performed by Naomi Newman of Traveling Jewish Theatre based in California. As the protagonist, Newman was struggling with religious belonging while growing up Jewish. I remembered how my own grandmother in Kentucky was determined that I would grow up Southern Baptist. Suddenly I knew that part of Naomi Newman’s growing up story was my story, and she and I were the same in that respect. I also knew that I only understood that at that moment because of the power of art for social connection and understanding,” said Jennings. These days Jennings is serving as the director of the Special Project, which started in 2008 when a mother whose son was incarcerated in the Louisville Metro Jail approached KFW with a vision that “someone should be making art” with families waiting two or three hours for a video visitation with their incarcerated loved ones. “No one was doing that work here in 2008, so we developed the KFW Special Project to create weekly art activities with families in the visitors lobby of the jail. When I retired from KFW there was still no one besides the Special Project directly focusing on children with incarcerated parents in the Metro Louisville Jail. So how could we stop offering the art activities then? Since 2016, when the Special Project became an independent network of artists and advocates, we have also began to work for more family friendly policies at the Metro Louisville Depart of Correction. This is especially important now with severe overcrowding inside the jail which makes the visitors lobby severely overcrowded, too,” said Jennings. Jennings believes firmly in the power of art and that art is for everyone. “Art has definitely been used as a tool of oppression, intentionally and unintentionally. Ideas of what counts as “real art” are often very elitist in our community, state, and nation. In my view, art is not a thing, but a way (to totally co-op a tag line for Arts Kentucky from years past),” said Jennings. Her activism was expressed in her writing and philanthrophy. Sallie’s first novel was published by Houghton Mifflin in 1961. It was followed by four collections of short stories; her most recent book, from Sarabande Books in 2014, is titled The Blue Box: Three Lives in Letters. She has also published six additional novels, three collections of poetry, numerous plays (produced off-Broadway and regionally), and the well-known family memoir, Passion and Prejudice (Knopf, 1989). In 1985, she founded The Kentucky Foundation for Women with a mission to promote positive social change by supporting varied feminist expression in the arts. At the time, the focus on the arts was radical. But Bingham knew the arts was a powerful tool for education, action, and self-realization. “The art created by talented women reaches under society’s prejudices, engaging people on an emotional, spiritual, or intellectual level that can make its message powerful,” said Bingham. Her latest project, a biography of the philanthropist Doris Duke to be published by Farrar, Straus and Giroux in 2018, continues the work of recognizing the achievements of women. “Doris Duke was maligned in the press during her entire life, and her achievements as a philanthropist have never been acknowledged or celebrated. This still happens to any woman who steps out of the role she has been assigned by the culture. Doris travelled freely, spent freely, and had close relationships with men and women from different class or ethnic backgrounds. This is enough to condemn a woman to misunderstanding even today,” said Bingham.